On the first day of our holiday we decided to go with something fresh and vibrant and hopefully even good for us. I’ve heard that there are a few different ways of making hummus but most involve chickpeas. We were at a trivia quiz a while ago and could not remember one of ingredients of hummus. It’s not a common household item. I’m talking about tahini – ground sesame seeds. It tastes a bit like peanut butter. Anyway the recipe is easy – you just blend all the ingredients together. I think I added too much tahini – I don’t really measure unless it’s baking. The hummus tasted strongly of sesame. I now know for next time. Tabouleh isn’t the first thing that comes to mind when thinking ‘salad’ but recently we’ve started exploring the breadth of salad and salad like dishes. 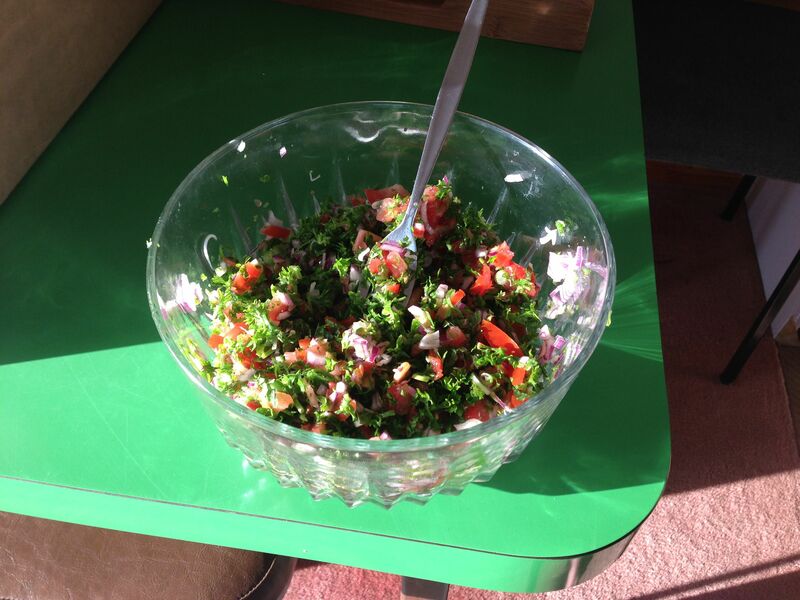 At our favourite kebab shop – Kebab Slateen Hamilton – tabouleh is one of the optional extras. We get it every time. Tabouleh calls for bulgur wheat, something we could not find in our local supermarket. Instead we decided to go for a similar item – Quinoa – surprisingly pronounced ‘keen wah’. It’s an Incan crop referred to as the ‘mother of all grains’. 2013 has been declared International Year of Quinoa by the United Nations, fun fact. Tabouleh survives okay in the fridge. We eat this for a couple of days. 14 Jan	This entry was written by Big T and published on January 14, 2013 at 6:56 am. It’s filed under Culinary artistry and tagged hummus, leh, quinoa, tabouleh. Bookmark the permalink. Follow any comments here with the RSS feed for this post.